Cucumber Archives - Q the Experience, Future Life Science. 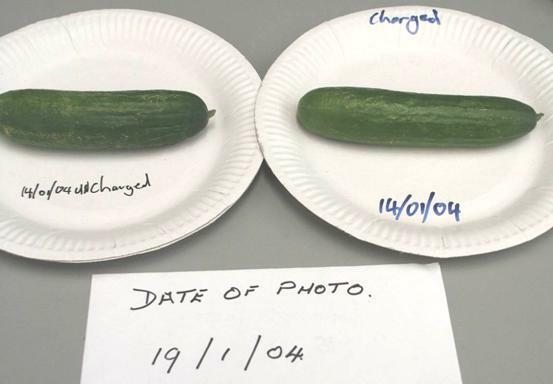 To conduct a longevity experiment in order to show the effects of supplying additional Bio Energy to a cucumber. This will be done using the patented QEnergySpa, BEFE from Q the Experience. 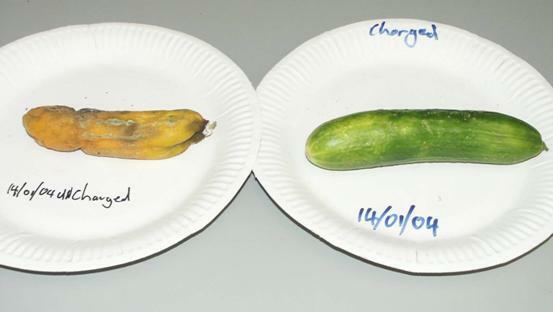 It is theorised that increasing the Bio-Energy content in a cucumber will have the effect of prolonging the life span (use by date) and reduce attacks by fungus and fruit flies. 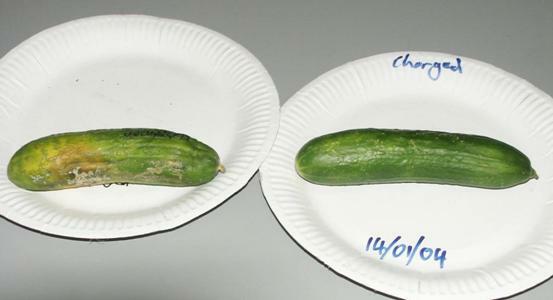 Two cucumbers of the same size, weight and age were placed into a bucket of water, one cucumber in each bucket. One of these buckets was then charged for 35mins the other left to be used for comparative purposes only. 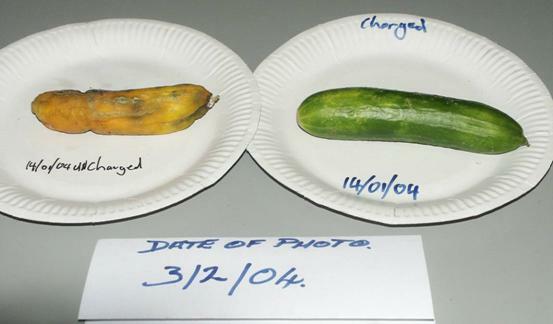 The cucumbers were then taken out of the water and placed onto 2 paper plates appropriately marked and dated. No further treatment of the cucumbers occurred and as little handling as possible was maintained. 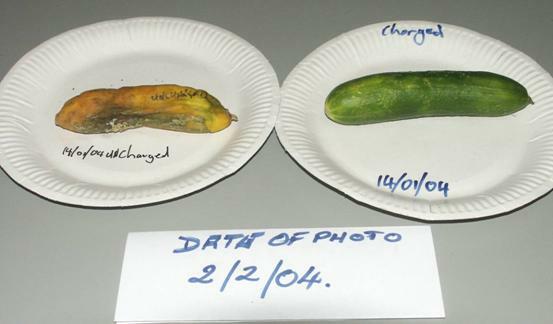 The cucumbers to be photographed each day and have any observations recorded. On the following pages a selection of photos from this experiment is shown. These photos show the daily progression of the life of the cucumber. 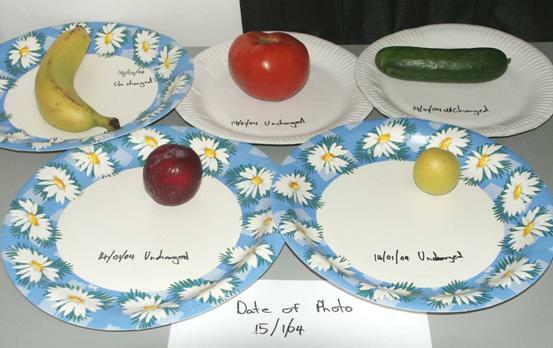 However as you can see on the initial photos the experiment started with five different fruits. These other fruits will be discussed in documentation elsewhere due to the fact that the outcome of the charging of the fruit may be different. 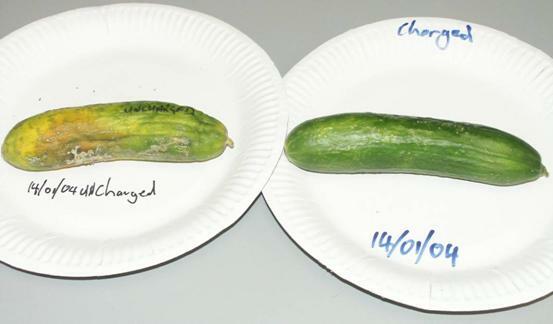 Studying the photos we find a gradual degradation of the uncharged cucumber but not really until day 7 is it noticeable, where the skin appears to start to break. It is hard to see due to the marks already on the cucumber. 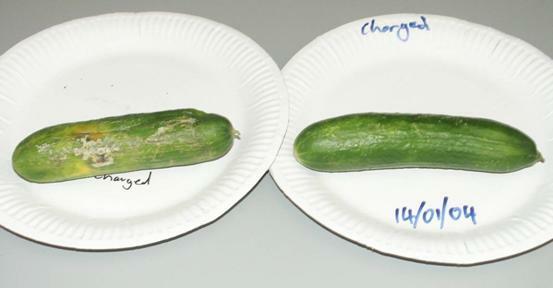 On day 7 and 8 it looks like a slight wrinkling on the tip of the cucumber end facing the charged cucumber. 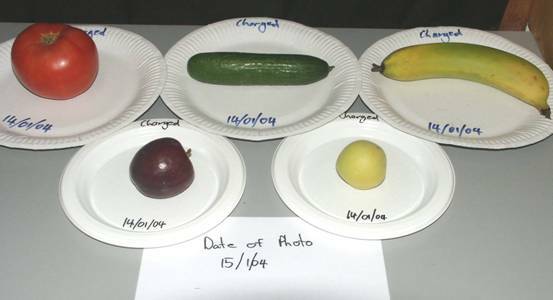 However if you look carefully on the photo from day 5, this appears to be a flaw in the cucumber which have been there from the beginning. Lets go to day 13 where we can see an additional shrinkage in the middle of the cucumber, it almost looks like a knife cut. 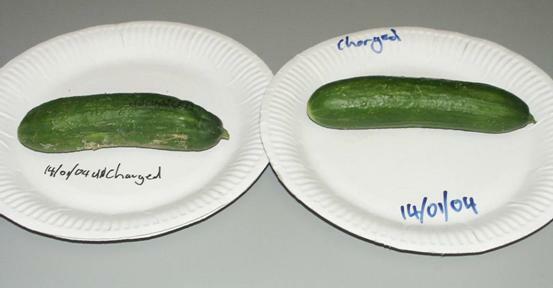 We still have no change in the charged cucumber. On day 14 the cucumber is starting to change colour and on day 15 this is quite evident as well as some additional shrinkage. 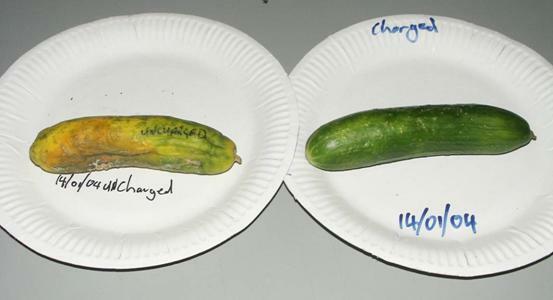 From day 16 onwards the uncharged cucumber just dwindles back to nothing. On day 20 the charged starts to change colour slightly. 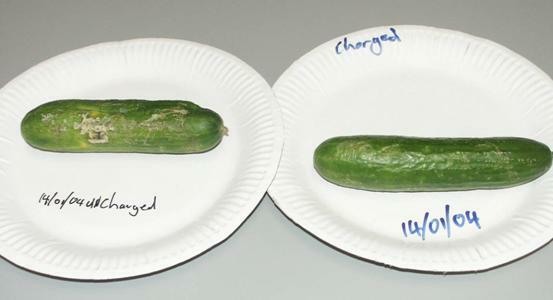 But by day 26 the uncharged cucumber just appears to be dried out, nothing left compared to the charged cucumber which is still more that edible. It does not appear to have dried out or shrunk at all. 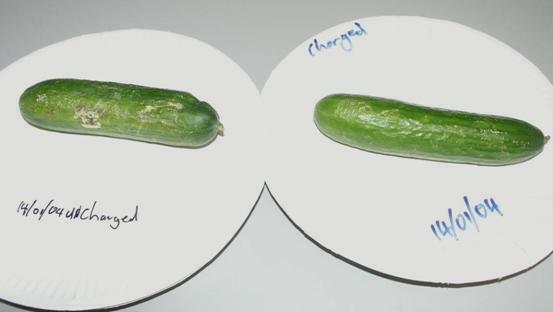 The cucumber was then cut open and as shown in that last photo, there is no degradation at all inside. Day 1: All the fruit was purchased at the same shop and at the same time. Each piece of fruit was treated identically except one group was charged with the QEnergySpa and the other group wasn’t charged. 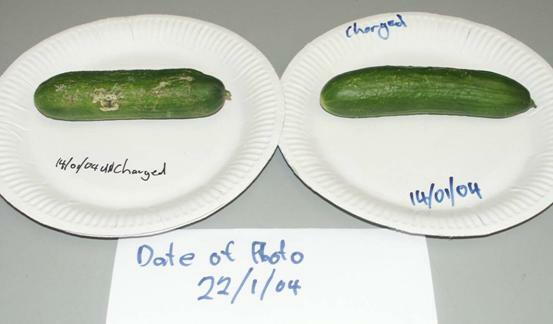 From the photos it is quite evident that subjecting a cucumber to Bio-Energetically rich water has the effect of prolonging the life of the cucumber by up to 2 weeks and possibly longer. 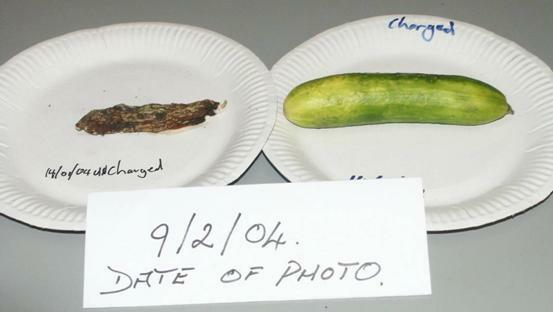 It has also been shown that fungus and fruit flies have not been a problem with the charged cucumber, but that may have become an issue over the week following had the experiment continued. We will determine that in the next experiment. Hence further testing is being conducted.